There is always a lot of music in our house. At any given point, there is usually someone listening to music, playing an instrument, writing some music, or at a minimum, reading about others doing those things. My husband is a musician. He plays guitar and piano. But he is also one of those people who could play just about any instrument with some level of proficiency if you gave him a few minutes to fiddle with it. Yes, even a fiddle. You can learn more about him and hear some of his music on his space here and you can buy his music on here on CDBaby.com. Both of my sons are learning piano and my oldest is also taking violin lessons. They both are quite good and seem to have been born with large parts of my husband's music genes. I, on the other hand, don't play an instrument anymore. My clarinet was retired immediately after the spring concert my senior year in high school. But I do love music and love to sing. So I am happy here in this musical home. I just took a quick mental count and determined we have 22 musical instruments (mostly playable and some otherwise) in our home. Which is why our home was the perfect spot for our youngest son's Cub Scout den to work on their Music belt loop requirements last night. Seven nearly seven-year-old boys learned about music, listened to some music, made a few musical instruments and then made some music of their own. 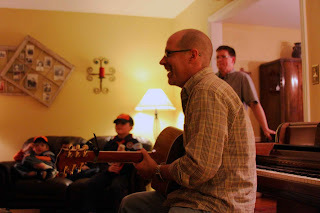 My husband led the musical discussion and exposed the boys to many types of music. He played classical, blues, boogie-woogie and jazz on the piano for them. He played some country songs on his acoustic guitar. Throughout, the boys were interested and engaged. But when he brought out the electric guitar and the amp, they really got excited. When his picked up the guitar, they started whooping and cheering like Eddie Van Halen had just walked on stage. And just as that familiar electric crackle of guitar plugging into amp sounded, they were up on their feet screaming. And as he stroked the first power chord, they began gyrating and dancing with abandon. It was an amazing sight. For most of the boys I assume, it was their first rock concert. But they knew just what to do. The only things missing were lighters held high and a hazy, funny smell in the air. The love of rock music and the attendant responses it provokes are hard wired into our children! 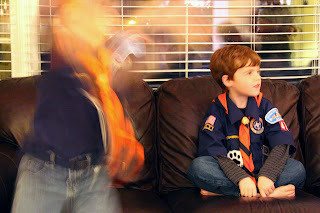 I only took a few images of the spectacle but this one really captures the frenzy that the boys were brought to.